There’s conceptual albums for all tastes. Styx gave us a dystopian future. Nine Inch Nails gave us the slow descent into madness of a person. Smashing Pumpkins gave us an esoteric trip through the mind of a rockstar having an identity crisis. 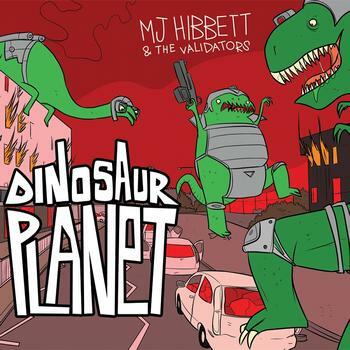 MJ Hibbet & The Validators offer an audiobook / musical / concept album about Dinosaurs kicking our collective arses. Dinosaur Planet is 33 tracks (real short ones, though) detailing in a very silly (but funny) way how well-armed and very, very peckish dinosaurs come ’round for a serving of Norwich human meat. Sounds icky, but if you want me to gross you out, well, pig skin is used for skin grafts and crackling. Enjoy your bag of Mr. Porkys. Can’t spoil the jokes, but in the style of a musical, they are very tied to the lyrics and sometimes they really get you going. Character wise, you’ve got a couple of funny ones, including an overbearing mother, a Red Shirt policeman and a Grampa who knew that his deranged writings were actually truth (but no one would listen). There are a couple of funny English-heavy jokes. The whole Norwich setting lends itself to a couple of quick quips, there’s some technobabble for the geeks (Extinction Level Event!) and there’s some clever weapon-assignment to dinosaurs. I for one would give up all hope if a stegosaur with a bazooka had me on its sights. Screw Velocirraptors, they are overrated (especially in ‘The Battle of Peterborough’). If you think Dinosaurs aren’t enough and this album should be more sentai, well, there are robots. And no, Michael Bay, you can’t sue them (although they are veering into some grey areas). The music of Dinosaur Planet has range. You can go from the usual musical form, some twee (nothing wrong with that) and then some sea shanties for the ol’ sea wolf in all our hearts. The end of the story is…well, let’s just say it needs more Jon Pertwee. That is all. Dinosaurs, robots, some vintage sounding rock pop and inside jokes, if it sounds like your bag of Calvin approved awesomeness, check it out. I did and I for one welcome our new reptilian overlords. MJ Hibbett & The Validators Website. Facebook. Myspace. Twitter. Posted in Musicals, reviewsTagged Dinosaur Planet, Geeky concept album, MJ Hibbett and the ValidatorsBookmark the permalink.